Mission Hills‐Hillcrest Harley & Bessie Knox Public Library has been completed. The new one-story, 15k sf building is four times the size of the former library and will serve the Mission Hills and Hillcrest neighborhoods of San Diego. It was built by C.W. Driver Companies. Located on the southwest corner of West Washington and Front Streets, the construction project includes a 30k sf, two‐story underground parking structure with 85 parking spaces and the formation of an adjacent cul‐de‐sac at the end of Front Street. Manuel Oncina Architects and Ferguson Pape Baldwin Architects worked alongside C.W. Driver Companies to design the library, incorporating both traditional craftsman and contemporary styles. The mission-style entry opens to an impressive lobby with 25‐foot‐high ceilings featuring trusses, trellises and a skylight, as well as a traditional reading room. Environmentally efficient elements such as rooftop solar panels instill energy cost savings and ensure LEED® Gold certification. The surrounding landscape incorporates drought tolerant plants. The new library is also designed to incorporate how community members learn, work and utilize civic space in the new era, providing larger gathering spaces and technological resources. The library’s community room will be the focal point for extensive library programs and community gatherings, such as hosted author talks, civic events and community celebrations. This spacious adaptable room features audiovisual equipment and opens to the 1.4k sf, outdoor patio, considered the building’s “front porch,” with large accordion-style glass doors. The 1.6k sf children’s area features its own computer lab and a themed story time area akin to the Hobbit houses seen in the “Lord of the Rings” movies. Other features include a 384 sf teen area, a 400 sf garden, a large meeting room, four study rooms, an adult computer area and an idea lab that offers 3D printing and other technology. The Friends Room creates a visible retail space for Friends of the Mission Hills-Hillcrest Branch Library book sales. The Mission Hills-Hillcrest Harley & Bessie Knox Public Library is located at 925 West Washington St, on the site of the old International Brotherhood of Electrical Workers (IBEW) office building and parking lot. 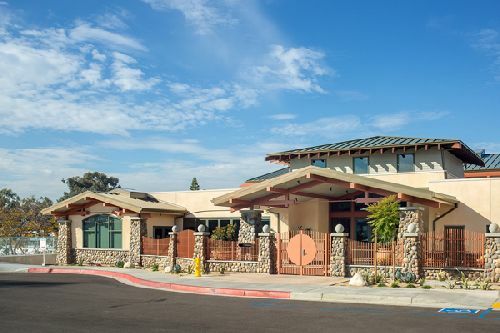 The City of San Diego purchased the property in 2004 and began demolition of the existing structures in May 2017 to allow for the new library to be constructed. The new library structure is 10k sf larger than the original library, which was built in 1961 and located down the street from the new location.